… at least not always. A while back I received an email from a young woman, asking me for advice. She told me, she had such a deep desire to travel, to see the world and to write about it. Many of her friends and family however, have been discouraging her from following her dreams. Lately she has been wondering, if they could be right. Should you just not follow your dreams? Unfortunately that is what a lot of young people are still being raised to these days. And for some reason this has been the first message of quite a few of this kind since then. That is why I feel the need to share my answer with you today. “Before I even start with anything, I have to tell you this: Don’t let anyone EVER tell you that you can’t do something! If it is a good thing and your heart is stuck to it, there is no reason why you can’t do it. Even if you don’t know how (yet!). You’ll figure it out! You are so young and your biggest advantage to others is this that you know what you want to do! After I finished school, I had no idea. I took a year off and traveled a few times with the money I had saved up over the years before. I went to Turkey 2 or 3 times and to the US for the very first time to visit a friend who was over here as an Au Pair for a year. Everything was new and exciting but I had no idea I would end up living here. Life is crazy beautiful! Back in Germany I wanted to become a photographer. But my parents wanted me to become something “decent” to have a “proper” job and make money to have a life like all the other worker bees. So I became a secretary and half way through I knew I wouldn’t do this for the rest of my life. I did not want to be someone’s assistant, I wanted to be my own boss. I still finished of course and worked in that profession for a while but after seeing through this world of fake smiles where the only thing that counted was money, I decided to leave. All these years I kept traveling but at the time it never occurred to me to write about it. You asked me about regrets. I guess not starting to write sooner is the only one but even work wise I don’t regret anything because becoming a secretary [or “Management Assistant in Office Communication” if you will] first taught me so many things I needed to start my own business. Oh, there is one thing. Before I left for the US, I got rid of so much stuff, clothes, etc. and there is still so much left. I wish within the years before I would have thought twice about everything I bought. Not only to avoid getting rid of it but to save the money for travels. Of course everyone is different and some people travel, come home again, work and travel again. That is a beautiful life too and that’s what I did back then. I had no idea I would have to fit my life into a few suitcases. Even now I’m not constantly traveling. So I come home to Tennessee and have a somewhat “normal” life. It’s not always easy, trust me. And companies don’t run after you with their money. It is a long process that needs a lot of work. This applies to you too! No matter what it is you are dreaming of, do it! Not everyone want’s to be a writer but I know your heart is burning for something and if not, find out what you love! Trust me, you will know it’s the right thing, when it feels effortless. That doesn’t mean it will be easy all the time. In fact it will be really hard work – but it will be worth it! Not everyone will understand or support you and that will be one of the hardest challenges. So find the ones who do, those who respect your future plans and are by your side, no matter what. If you have that, you will be stronger but if you don’t, hang in there, the right people will come. Find out what you have to do to start achieve your dream. Your parents or friends may tell you to think small, play safe and maybe even follow their dreams so you will not get the answers you need in order to go after what is important to you. Go to the people who already made your dream their reality! Don’t ask the ones who have other dreams! But also keep in mind that the ones who love you, will also grow with you. We are all brought into this life to learn. They may not understand you now (and if they do, you can be very thankful!) but if they really love you, they will eventually see what makes you happy. Leave me a comment and tell me about your dream! Did you already go for it? Are you on your way or already there? Are you just starting out and taking the first steps? I would love to read your story! If you have a friend who needs to read this, share it with them and be one of the people who understand. I survived riding a python. A very different way to prepare a trip to Borneo. i love this. I think people have an idea in there head of what you should be and if you chose different from that or from their ideas of life you are wrong ! My whole life my friends have asked me when I am going to get a boyfriend and have babies and now at 31 they look at me and wish they had done what they wanted and not just the norm. I am not saying what they are doing is wrong or that they are unhappy. But this lifestyle is for me and I bet the stories I tell when i am old will be a lot more interesting ! I agree completely. It is not anyone else’s responsibility to make you follow your path and dreams but you! Dreams are good; they propel you to do things you never even dreamed of. it’s typical for friends to be guarded, but they are only trying to help. The key is to surround yourself with people who can support your dreams. I was her a few months back. All I wanted to do was travel, but at eighteen people said I couldn’t, shouldn’t do it. Fed up, I planned a trip in one month and left. Now I know that that is all I want to do. Great post and perspective! It’s natural for family and friends to be concerned for you, but they are looking at life through their own lens. So their opinions will always be slightly biased and you should take all of their advice with a grain of salt! My husband and I both left our previous careers to follow our dream of traveling full time and starting a blog and making a business of it. We have had supporters and also those who frowned upon our leap of faith. Ironically, it was the response from the naysayers that assured us that we were doing the right thing. Because we all know why naysayers are naysayers. Anyway, you are inspiring and thank you for saying yes to dreaming! I have a great group of supportive friends and a very anxious mother! This means I get to talk about all of my dreams and also, very importantly, think of the risks and the dangers involved. It helps to balance things out if you have someone challenge you every now and then. It can be infuriating but dreams and planning together are the way to do it in my opinion. I love dreaming and making lists of big ‘once in a lifetime’ things to do and places to go and the only way I’ve gotten to do some of it is through working out the options and planning (money a lot of the time). Definitely follow your heart but keep your head! I could not agree more! Some of the most important changes to my mindset that I made was to stop worrying about what others thought and to stop listening to people’s negativity about what I wanted! Great post, thanks. I try to be unreasonable in everything I do. This way I am sure to live my life on my own terms and in the very way that I want to, without feeling the constraints of society or other people. So interesting this post…Nothing is impossible!!! Looooove this. 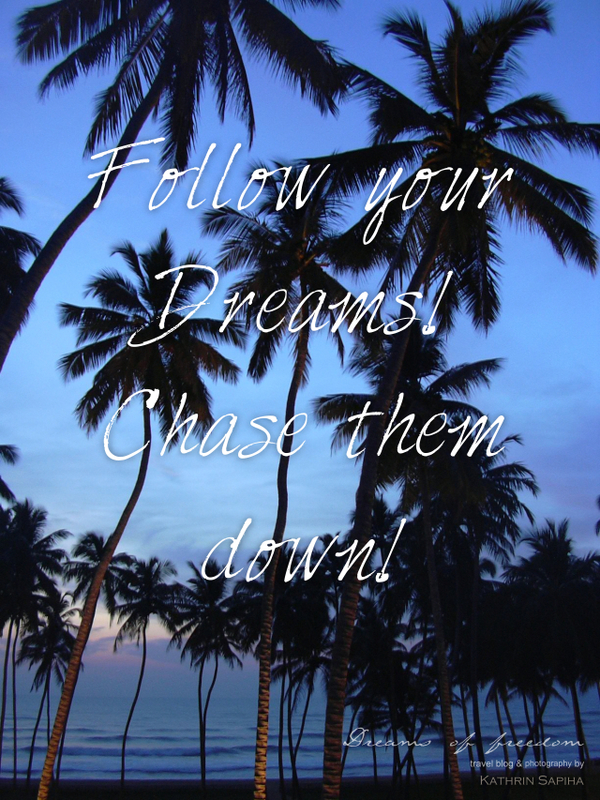 So true – follow your dreams, no matter what they are. Tweeting this too! I agree with you. No matter when how one should follow his/her dream. After my divorce I had plenty of time to kill, so I decided to take guitar and drums lessons,something I wanted to do along time ago,and yes it was never too late,and I am enjoying it. Today,I’m living for me and only me. I gave and gave and ended up alone,but it worked for me. Now I have the time to think and recalculate, learning from my mistakes,and not putting anyone or anything before me,my endeavours,and my life. Now,and after this aftermath,I got to know who is my true friend and who isn’t. Those who once you thought they are you friends turned out to be not. Go after your dream ,do not let anyone hinder your efforts or become an obstacle between you and your dreams, and remember those who care will be there for you and those who don’t,well they don’t,period. Bottom line , if you don’t follow your dream,others will,and you will be long forgotten by all. Great post. Thank you and congratulations. Yes, follow your dreams, and do not listen to your family and friends, because they do not understand how you are feeling inside. There is only one life, therefore leave it with passion, and do not hesitate to take a flight to a new destination as soon as you starting to feel some kind of sadness. Traveling to Vietnam changed my life, and it’s was just the simple action to book a flight ticket to Hanoi the same day I took the decision. I hope someday you will visit this destination. I’m a huge fan of coaching and NPL as well. Robert Dilts and John Whytmore are my favorite authors. Fabulous advice Kathrin! I am one of those fortunate people whose parents encourage me to follow my dreams, especially my travel dreams! When I graduated from university, my dad told me that as long as I started my career by my early to mid-thirties, I’d be fine and in the meantime, why not enjoy some overseas adventures!?! Which is exactly what I did, starting with living and working in the Caribbean for 6 months, then Spain for almost a year, a year in Japan, vacations in Thailand, Bali, Guatemala. I recently realized that now, in my mid-forties, my dream of living in Spain for part of every year has come true. Adventure on and Buen Camino!